The SCDNR got a helping hand on Tuesday from members of the Beaufort-Jasper county legislative delegation and other local officials in helping spread the word about the importance of boaters being more aware of the wakes they cast while damaged docks along waterways in the two counties are being repaired. Warning signs ask boaters to control speeds and reduce wakes in damaged areas. At a press conference hosted at the new Bluffton Oyster Factory Park Boat Landing on the May River, SCDNR Law Enforcement Division officials unveiled new temporary signage that will be placed at boat ramps within the two counties encouraging boaters to slow down and be considerate of property owners who are attempting to make repairs to docks damaged by Hurricane Matthew's destructive path in October. 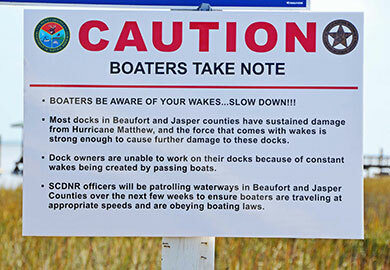 It is an issue up and down the South Carolina coast, but Beaufort and Jasper counties were particularly hard hit, and many boaters simply don’t realize that the wakes caused by passing boats can make it impossible to make effective repairs to damaged dock, SCDNR Lt. Michael Paul Tomas told the members of local media organizations. State Reps. Jeff Bradley of Hilton Head and Weston Newton of Bluffton took to the podium to encourage local boaters to be mindful of their wakes and considerate of their neighbors who are still dealing with damage from the storm. Other delegation members who could not be at the press conference due to previous commitments in Columbia expressed their support for the effort via e-mail. "Rep. Bill Herbkersman, who represents this portion of the May River, could not be here today, but he asked me to share with you all and especially with Col. Alvin Taylor and the folks from the SCDNR our appreciation for them taking this step to make these waterways safer while so many of our residents are trying to recover," Rep. Newton said. "Folks, please be careful out there. There is still floating debris, and we don’t always know where it is and we don’t want people to get in trouble, so please slow your boats down and be observant of the no-wake signs and be courteous to your neighbors," Rep. Bradley added. "And again, we’d really like to thank the SCDNR for all the hard work that you’ve done." Bradly singled out SCDNR’s Lt. Thomas for "taking ownership" of problems related to storm debris in the water and working hard to resolve them after the storm. Bluffton Town Council member and Oyster Factory seafood market owner Larry Toomer is on the water nearly every day. He reiterated the concerns expressed by Reps. Bradley and Newton. "[Unless it's an emergency] You've got plenty of time to get where you're going," Toomer said. "If you can stay farther away from any of the docks or boats that are being repaired, just do that. Just go slow and try to be courteous." That message was also driven home by Lt. Thomas. "Be courteous of the folks who are still recovering from this event," he said. "Not only down here on the south end of Beaufort County, but there's also areas in the northern part of the county and in Jasper County where folks are trying to rebuild and recover. If you're out on the water, be mindful of your wakes, and of the damage that you can still cause from your wakes." As the signs that will be placed at boat ramps around the two counties point out, SCDNR officers will be patrolling local waterways over the next few weeks to ensure that boaters are travelling at appropriate speeds and obeying boating laws. It’s important to remember that "you are responsible for your wake, and for any damage it may cause," Thomas pointed out.